The Attainment of the Holy Grail by Sir Galahad (1898-99), a tapestry after a design by Sir Edward Burne-Jones (1833-1898). ©Christie's Images, London. 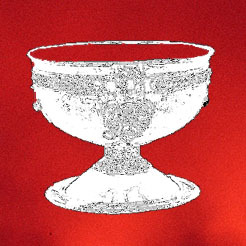 he Grail is the crystal cup from which the Redeemer and His disciples drank at the Last Supper: in it Joseph of Arimathea caught the blood that flowed from the spear-wound in His side when he hung on the Cross. For a long time it was mysteriously lost to the sinful world and preserved as the holiest of relics. Then, at a time when the world was most harsh and hostile, and when the faithful were hard pressed by the unbelievers and were in great distress, there sprang up in certain divinely inspired heroes, filled with holy charity, the desire to seek out the vessel - that mysteriously consoling relic of which there was ancient report - in which the Saviour's blood (Sang réale, whence San Gréal - Sanct Gral - The Holy Grail) had been preserved, living and divinely potent, for mankind in dire need of redemption. 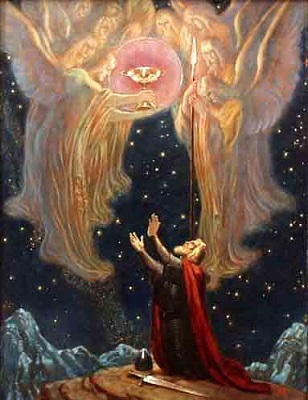 Above left: Titurel Receives the Grail and Spear, oil painting by Franz Stassen. 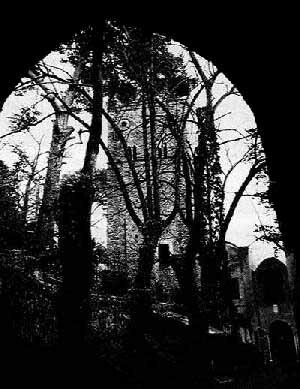 eyond the mountain height in whose hallowed, night-dark forest, at a place where charming valleys wind toward the south and its laughing lands, and Monsalvat lies accessible only to the votary, there lies another castle, as secret as it is sinister. It too can be reached only by magic paths. The godly take care not to approach it. But whoever does approach cannot withstand the anxious longing that lures him towards the gleaming battlements towering from the unprecedented splendour of a most wonderful forest of flowering trees, out of which magically sweet bird song and intoxicating perfumes pour upon all around. - This is Klingsor's magic castle. Concerning this sorcerer dark things are said. No one has seen him: he is known only by his power. That power is magic. The castle is his work, raised miraculously in what was previously a desolate place with only a hermit's hut upon it. Where now, in a most luxuriant and heady fashion, all blooms and stirs as if it were forever an evening in early summer, there was once only an isolated hut. Who is Klingsor? There are vague, incomprehensible rumours. Nothing else is known of him. Maybe he is known to old Titurel? But nothing can be gathered from him: dulled by his great age, he is kept alive only by the wondrous power of the Grail. But there is Gurnemans, an old squire of Titurel's, still loyally serving Anfortas; he ought to know something of Klingsor: also he sometimes lets it be understood that he does; but not much can be got out of him: no sooner does he seem to be on the point of revealing something unbelievably strange, than he falls silent again, as if these are matters of which one should not speak. Perhaps Titurel has at some time forbidden him to speak. It is supposed that Klingsor is the same man who once so piously inhabited the place now so changed:- he is said to have mutilated himself in order to destroy that sensual longing which he never completely succeeded in overcoming through prayer and penance. Titurel refused to allow him to join the knights of the Grail, and for the reason that renunciation and chastity, flowing from the innermost soul, do not require to be forced by mutilation. No one knows the precise facts. ll that is certain is that it is only in the reign of Anfortas that people have begun to hear of the castle, also that the Knights of the Grail have often been warned against becoming ensnared in the assaults upon their chastity, originating in that place. In fact, concealed in that castle are the most beautiful women in all the world and of all times. They are held there under Klingsor's spell for the destruction of men, especially the Knights of the Grail, endowed by him with all powers of seduction. Men say that they are she-devils. Several Knights of the Grail have failed to return from their missions; it is feared that they have fallen into the clutches of Klingsor. What, unfortunately, is certain is that Anfortas himself, going forth to combat the sorcery threatening his knights, fell into a trap, decoyed by a strange, wondrously beautiful woman and treacherously set upon by armed men who were to take him bound to Klingsor: with difficulty he fought them off, and turning to flee, received in his side the spear-wound from which he now suffers and for which no cure can be found.